People in the news business are avid consumers of news about our industry. We get half a dozen industry newsletters a day in addition to a regular stream of stories that catch our attention. We’ll share some of the more interesting and useful pieces here so you can keep up too. Check back often; we’ll keep it updated! • Two-thirds Of Americans Have Heard Of Bots But Many Fewer Think They Can Recognize Them On Social Media — A good overview of how this technology works and ideas for keeping an eye out for it. • What Research Says About How Bad Information Spreads Online — Scholars are research now false information spreads — and how to stop it. • I Taught My 5th Graders How To Spot Fake News. Now They Won’t Stop Fact-Checking Me — This column in Vox has lots of media literacy tips for all readers, not just 5th graders. • Americans And The News Media: What The Do — And Don’t — Understand About Each Other — Twin surveys of journalists and the public show that the public is confused by what the news media does, and the press doesn’t do a very good job of educating them. 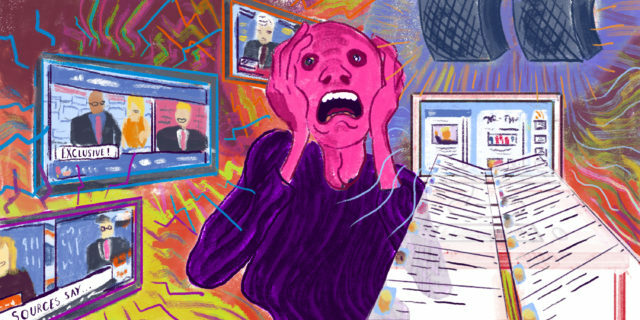 • Nearly 7 In 10 Americans Have News Fatigue — The Pew Research Center surveyed news consumers and found most people are just overwhelmed by how much news is out there. Republicans felt more unable to keep up than Democrats. • The Crisis In Local Journalism Has Become A Crisis Of Democracy — Two veteran journalists look at the toll that is being taken on the public with the escalating loss of local news reporters throughout the country and cutbacks at community newspapers. • Welcome To Our New Local Media Hellscape — Ideological “news” websites are springing up all over the country in front of the 2018 elections. Many make it impossible to tell who owns and operates them. • Should We Stop Saying Fake News? — The Poynter Institute, a journalism think tank based in St. Petersburg, Florida, makes a case that the phrase has become too weaponized to be useful. • What Some Reporters Get Wrong About The First Amendment — Columbia Journalism Review asks legal scholars what people — including journalists — think the First Amendment is supposed to do for us. • Study: Bots Have Turned Twitter Into A Powerful Political Disinformation Platform — A new study sheds light on how the social media platform can be hijacked by bots to spread political disinformation during election campaigns. • It’s Time To Re-think How We Cover Trump — A Columbia Journalism Review essay on why journalists need to take back the agenda in 2018. • Columbia Journalism Review Special Report: Making Media Literacy Great Again — A basic understanding of where news comes from is back on the syllabus as students navigate an increasingly bewildering media environment. • Study: Educating News Consumers About the Media Can Curb Conspiracy Theory Appeal — The more consumers understand the news media and how journalists do their jobs, the less likely they are to buy into conspiracy theories.